Chocolate and nuts just go so well together, and it what better form than a tasty cupcake. 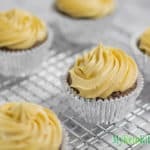 Our Low Carb Chocolate Peanut Butter Cupcakes are so delicious that everyone wants one! Line a standard 12 cup muffin tin with silicon cupcake molds or cupcake papers. In your stand mixer, add the peanut butter, melted butter, Natvia, salt, vanilla and baking powder. Cream ingredients together using the whisk attachment. Add the egg one by one, while the stand mixer is mixing on a medium speed. Stop the mixer and scrape down the sides, add the cocoa powder and turn the mixer back on very slowly. Add the coconut flour and heavy cream and mix until combined and free from lumps. Allow the mixture to sit for 2 minutes, so the coconut can soak up all the liquids. Evenly spoon the mixture amongst the 12 prepared muffin tin holes. Bake for 15-19 minutes. Cupcakes are cook when an inserted skewer comes out with a few crumbs clinging to it. In your clean stand mixer bowl, add the softened butter and peanut butter. Cream with the whisk attachment until smooth. Add the icing mixture a few tablespoons at a time on low speed, until it is all mixed it. If your frosting is too firm, add the heavy cream a tablespoon at a time until your frosting is smooth and pipable. Spoon your frosting into a piping bag with a star tip. Enjoy immediately or refrigerate for 30 minutes to firm up the frosting. Store any remaining cupcakes in the fridge for up to 1 week.